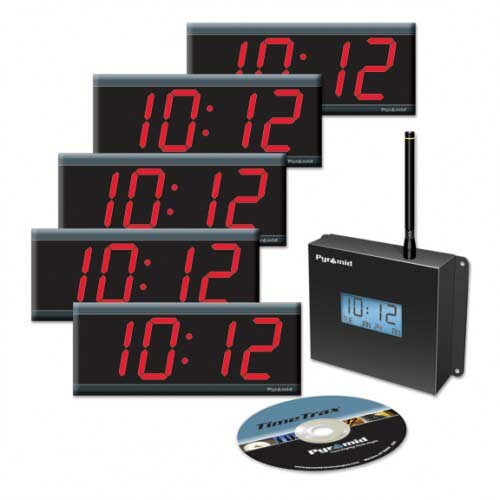 4 easy to read digital clocks with LARGE numbers, one wireless transmitter. Mix with other Pyramid clocks. SEBD5R6SR. Free shipping USA. Does not ship outside USA-48 states. Extremely easy to see! : 4 x 6 LED clocks. Complete solution for an instantly synchronized master clock system. Easy setup right out of the box. Absolutely everything that is needed is included, it's all here. - or from the optional GPS satellite signals. Download and read the factory brochure by clicking on this line. Add Pyramid 5300 signal timer module, and now you can ring bells, or send a signal to your existing intercom system using readily availble signal generators.